If you are one of those people, who think Hair Metal is dead, I'd like to introduce you to this guy: Singer Julian Angel is a very busy vocalist and businessman. Beside his band activities with BEAUTIFUL BEAST he also organized his own music conference, called MusicBiz Madness, in the last few months. Nevertheless Julian took the time to talk about this event, his forthcoming Beautiful Beast album and Hair Metal in general, so check this out! Hello Julian, great to talk to you. 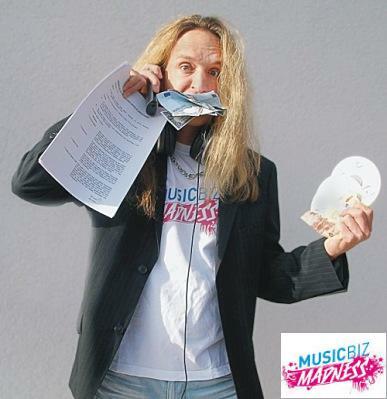 You were very busy in the last months with your workshop-event MusicBiz Madness. So tell us something about it. What is the concept behind it? Where did the idea come from? Julian: The idea is based on some American music business conferences where you always get a load of knowledge and information. In Germany, though, it has always been about tech talk and big-wig meetings. So I created Germany’s first ever major music business seminar event for independent musicians. I have invited a load of keynote speakers with a long background in the business who shared their knowledge with the young audience. Among others I had Goar B., producer of Lou Bega’s world-smash-hit “Mambo No. 5” and Axxis singer Bernhard Weiss. How satisfied are you with the event? What are the reactions of the visitors and of course the musicians, who talked about their experiences in Musicbusiness? Julian: Both attendees and speakers loved the concept. Quite many people shook hands with me after the event and literally thanked me for providing such high class information. Could you imagine to organize another event next year? Maybe on a more international level? Which things could have been much better and which things were better than expected? Julian: Everything was great: the keynote speakers, topics, the information provided. I had wished for better ticket sales, though. Getting more musicians to go there will be another challenge next time. Musicians in Germany, unfortunately, aren’t as business savvy as musicians in the USA, for example. If you could choose any referents you want: who would it be? Julian: Gene Simmons on an international level. But MusicBiz madness is not that much about presenting superstar speakers. Any DIY musician willing to share a success story is welcome. Which was the most interesting topic for the audience? Julian: Probably DIY marketing methods presented by documentary film producer Marc Weissenberger. Optimizing your PRO royalties was another highlight as well as Bernhard Weiss’ tour stories and calculation. What are the strongest worries of young musicians nowadays? What do you think? Julian: Making money. And that’s where MusicBiz Madness comes in to help. Do you believe in "Kickstarter"-projects in Musicbusiness? Julian: I know of a few bands who really made it happen through crowdfunding. I haven’t seen through the concept entirely yet. It seems to me like a kind of presale. You take money and offer some goods in return – that’s like making a sale, right. Your own records are all self-financed and self-produced and sound really good. Do you think musicians still need major labels today? Julian: If you can come up with the money or, as an alternative, great creative ways to draw attention, you can well do without a label. You have to separate labels and distributors, though. Having a distributor to get your records in stores is a great thing. When did you decide to join Musicbusiness and why? Julian: I probably made that decision when I decided to become a musician. If you want to succeed playing music you will have to make money: sell records, play gigs that pay, write songs for other artists, get radio play that generates royalties and so on. You can’t just sit around and wait for something to happen. That’s interesting: Even Goar B., who has sold over 14 million records by now, said that he still has to polish door knobs and kiss butts at the record companies. See, nothing comes for free. Let's talk about something different: your band Beautiful Beast! Your last album "California Suntan" was my personal summer record of the year. How successful was it in general? Julian: California Suntan was successful in that it generated a profit. A profit, and here comes business again, I will reinvest in a new Beautiful Beast album which I will start recording soon. Again, the USA proved to be a major market for good old fashioned late 80s hard rock. You said there will be a third Beautiful Beast record in the end of this year. You know, the third album is always the "make it or break it" record, so do you feel much under pressure? Julian: Not at all. It will be a pleasure recoding it. Due to the production and organisation of MusicBiz Madness I haven’t recorded for almost half a year. So I’m quite hungry now and I’m sure you will hear that. There will be a music video up front to tease the album and the songs I have written so far, still existing in my head only,sound great. For those people, who haven't heard from you yet: what can they expect from the forthcoming Beautiful Beast album? Julian: A trip back to 1989. Full of all the cliches that period has been known for – but seriously. Beautiful Beast is not a comedy act like Steel Panther. It’s damn serious. If you are an 80s relic you will love Beautiful Beast. So, which points have to be fulfilled to deliver a typical 80’s rock album? Julian: Key parts of a song are great guitar riffs, not just power chords. Catchy melodies are a must, harmony vocals too – many new bands forget about that. A cool guitar solo is mandatory as well as generally great musicianship. With Beautiful Beast I also avoid anything that happened after 1989. The guitar I’m holding was made in the 80s and I don’t sing about things that happened after that specific year. Are there plans to bring Beautiful Beast on stage? Julian: I’m always making plans for that. However, they always failed due to the lack in professionalism of my musician friends. It is hard putting a band together with excellent musicians that have long hair on top and still have the time to rock out. Like I said, this is Germany, not the US. You’ve said you will shoot a video to the next Beautiful Beast single. What will it look like? Typical 80s? Beach, sun, hot girls, … what are your ideas? Julian: I have two concepts in mind. A cool one and a funny one. Of course, it will involve the band and at least one hot rocker girl. Let me surprise you. The song will be named “Big Stuff”, by the way. 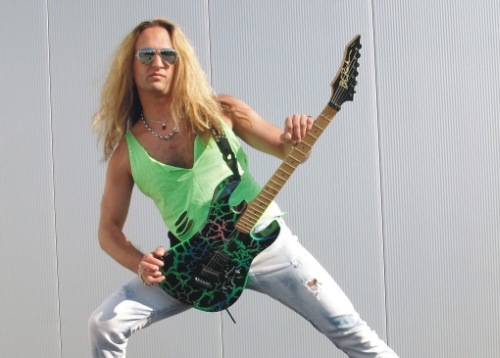 Hair-Metal celebrates a great revival in the last few years, especially in Sweden. Your style is close to the sound of old American glam rock bands like Poison, Bon Jovi, Ratt and so on. What is the difference between American and Swedish Hair-Metal in your opinion? Julian: American music always had more rock and roll and soul in it. Scandinavian music used to be more technical, but often also catchier. I don’t make much of a difference between the two. There is a difference between old and new Hair Metal. Guess what, the old kind is way better. The new sleaze stuff often sounds too much like punk rock. The kids today name Guns n Roses, Mötley Crüe and L.A. Guns as their influences, but they probably never realized how great those bands had been. Kids, play more riffs, not power chords. Sing, don’t scream. Add harmony vocals, not gang shouts. If you have two guitarists in the band, have them play different parts. You said once, Beautiful Beast will always sound like a band from 1989, but a lot of bands change their style over the years and the excuse for everything is "we just develop". What do you think about that? Julian: Let me make this short. You know why AC/DC is so big? Because they never changed their style. Everybody is complaining about bad record sales, but fans of Rock and Metal still like to buy physical CD’s. Why is that? What is the difference between those people and other music genres? Julian: Rock 'til you drop - I'm happy to provide the music! Julian, thanks for the talk! I’m very looking forward to your new album! Julian: Me too, believe me. Thanks for the interview too, see you.